The long-awaited CRF450L is here and we put it to the test. The 2019 Honda CRF450L’s arrival is highly anticipated to dual-sport freaks and geeks. The hype train following its announcement back in May has been plentiful, and it’s muscling its way into a set of popular motorcycles powered by a market segment that is seeing rare growth. In other words, dual-sport is so very hot right now. And Honda’s presence ushers in an air of undeniable legitimacy and should fuel the dual-sport trend nicely. With its awaited arrival comes a lot of expectations. A lot. This bike is under the microscope of a gaggle of experts who have enjoyed the trenches of dual-sport riding for a while. And based on the amount of strong opinions, misinformation, misleading comparisons and misguided advice on this bike already afloat in the dirt bike ether, we can safely assume this bike is high on the consideration list for many. Really, the most common question we get about this bike is: “What is it?” And that’s not cut and dry. Is it ready to line up at an enduro and compete head to head with the European bikes? Will it put the rest of dual-sports out of business with more performance than the stalwart models but keep the comfort? Is it worth the premium price tag? How much does it weigh? We attended the press launch Honda held in the soggy Pacific Northwest and came away decently impressed with the new Honda in our first-impression report. It’s hard to get critical or even over-analytical when you’re riding in scenic terrain on epic dirt with a full belly of fantastic food. So, we grabbed a test bike back here at our home offices and hunkered down for a real review of the all-new CRF450L. 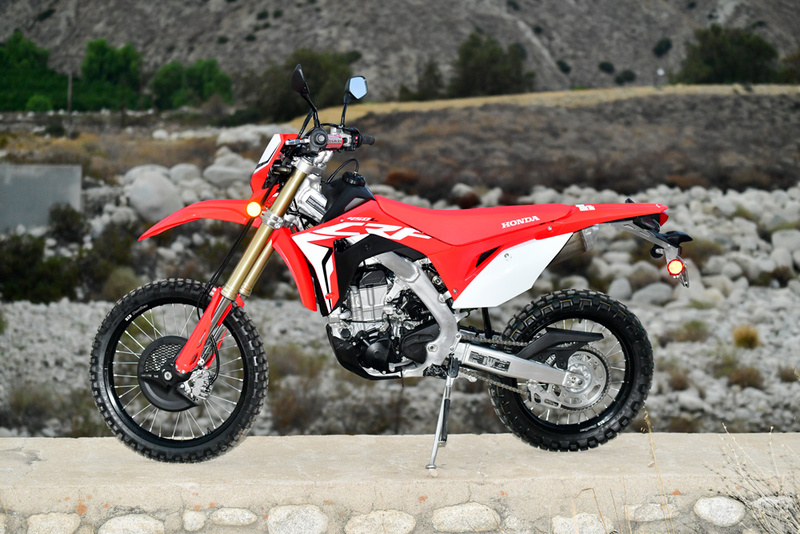 It’s fairly easy to see what the Honda CRF450L is not. It is not a race bike. It doesn’t really feel like a converted off-road woods weapon with blinkers. While its roots certainly sprout from the updated CRF race machines, the modifications done to the platform for dual-sport use make it worlds apart from most Hondas you’ll see racing on the weekend. 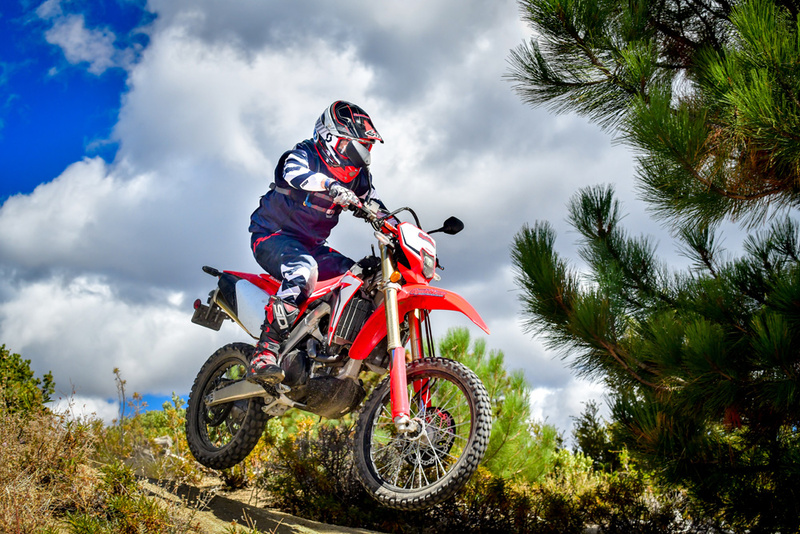 Its closest in-house relative is the recently launched CRF450X—a machine with performance more in line with the competition-derived dual-sports from Europe than the CRF450L has. One could easily argue the Honda CRF450L is a bike closer to the pedestrian side of the dual-sport spectrum than it is the aggressive/competitive side. On quite a few levels, it aligns more with the subset of dual-sport long-dominated by cost-conscious, insanely dependable and fairly vanilla bikes like Suzuki’s DR-Z’s, Kawasaki’s KLRs, and even Honda’s own CRF-L line (650s and 250s). But, it comes with a premium price tag, tighter service intervals and is compromising some on-road comfort and range in favor of performance here. Where the CRF450L thrives in the range of dual-sport isn’t easy to define. It’s a bike that is spanning a lot of territory. It’s a bike that has a schizophrenic personality at times, likely because it can do so many things. But what is it really best at? That’s what we’re trying to find out. Finally one of the Japanese manufacturers listened and gave us a true dirt bike with a license plate. Hope the others follow. 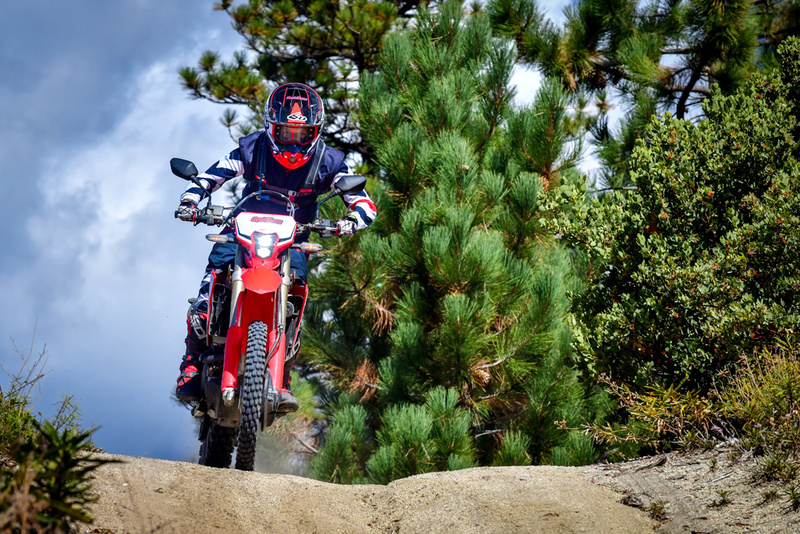 The CRF450L’s performance spectrum pulls away from the mellower models of dual-sport, really, and significantly so as conditions get more aggressive. But even on flat roads, you can instantly tell this isn’t an old-school dual-sport bike. Its power delivery is really good. It pulls with healthy torque and acceleration to get moving. Sure, it’s muffled to the max with engine-engulfing insulation, chain-comforting cushions and massive exhaust-blocking baffles. But ignore the lack of sound and feel what the bike is actually doing and you’ll notice the power is real, real nice. It’s not race-bike power delivery. It’s not snappy. But it has good, controlled, and consistent pulling power. Every single one of our test riders was happy with the Honda power delivery and were surprised with its smooth, yet strong, linear delivery after hearing some premature negative comments/assumptions from the dirt-bike world. Complementing the power is the chassis. This isn’t a bike held up by bargain-basement suspension components from the ’80s. It’s fully equipped with high-end off-road suspension and its stock settings deliver some of the most comfortable and capable off-road movement we’ve felt in a while. Yeah, it’s gets maxed out in big bumps. But that’s not uncommon in all off-road settings, including stock race models. The suspension exhibits almost zero compromise for the entire off-road spectrum, apart from racing conditions. And, considering the job it’s doing with a heavy bike, this is more than commendable. 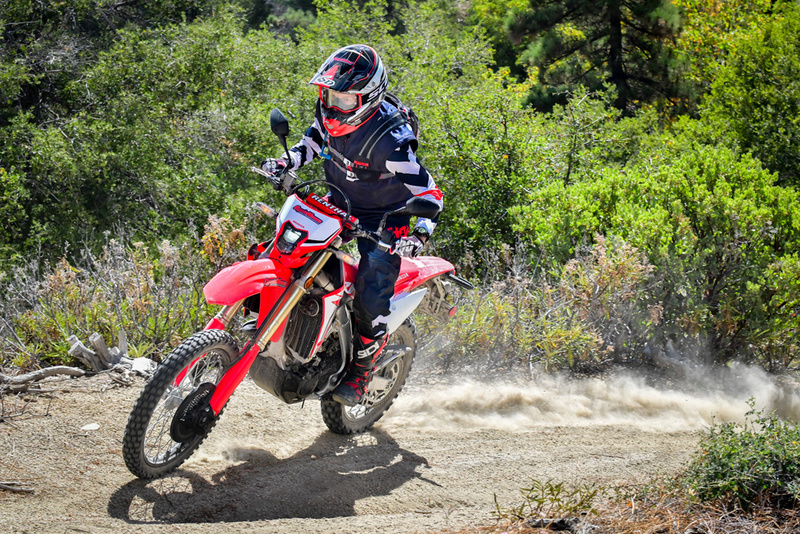 In fact, during the course of testing for the dual-sport comparison we’re currently working on, most test riders consistently applaud the stock suspension and overall balance of the Honda chassis. We did have one annoying fueling condition arise consistently with the CRF450L. It has a tendency to pop-stall at low rpm under load. This is a familiar condition with leaned-out four-strokes. Unfortunately, this happens when you really don’t want it to most of the time—like in technical situations. The condition seems to worsen as the clutch heats up, and we’d like to see a little more resilience in the clutch to more cleanly disengage in these situations. This would help eliminate a bit of drag on the engine when the regulation-friendly ECU tells our EFI to go ultra-lean. We ran the stock IRC tires on our test bike through a couple of tanks of fuel. They perform decently for the segment but are certainly a compromise when you want more significant off-road grip. As with all dual-sport and adventure bikes, we recommend wearing stock tires out as you ride a new bike. Find out where you really will ride, and buy tires that are best for that after the stockers are toast. For most of this test, we fitted on Dunlop 606 DOT-approved tires. These offer a lot more dirt traction without sacrificing much on the pavement. Those engine covers act as both sound-deadening devices and protection. We’re in no hurry to remove them. The 450L comfort is right in the middle of it all. Not as sharp as race-bred models and not as soft as street-focused machines. Overall, it vibrates less than its dirt-bike competition, but it’s not as smooth as the real mellow dual-sports. It still has the seat shape of a race bike even though the foam is thicker. Its ergonomics are a bit polarizing. For most riders, the bike is most comfortable to ride when sitting. So, it fits with the old-school dual-sport world here. But the frame is race-like and the bike likes to steer with the rear tire, so it’s not a commuter, either. Its handlebar bend is built to make room for the switchgear controlling the turn signals, horn and headlight and, while it’s plenty tall to stand up with, it just sort of falls back in your lap when you’re on your feet. The “L” still has a slight “traditional” dual-sport feel on the trail, but it’s more than capable when the speeds pick up and the terrain gets tough. 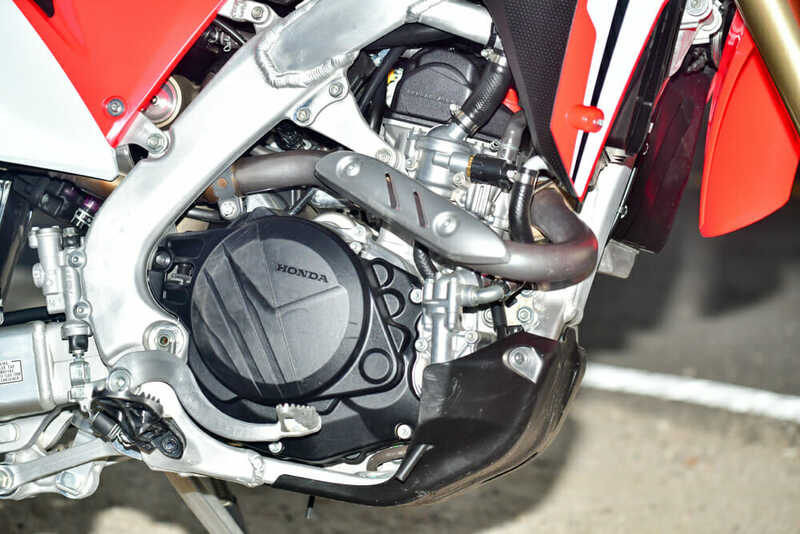 On the quality side of the coin, we’re doubtful Honda will suffer with the CRF450L, especially when it comes to the external structure of the machine. The street-legal running gear is top-notch and far from the disposable units currently featured in the dirtier side of dual-sport. The LED front headlight is actually very usable at night and provides good visibility on roads and trails when the sun gets low. The turn signals are miles above the rest with good looks and permanence. We see these as nearly indestructible—at least compared to the rest of the fragmented ones we’re surrounded by from Europe. The rear section is also not likely to fail. 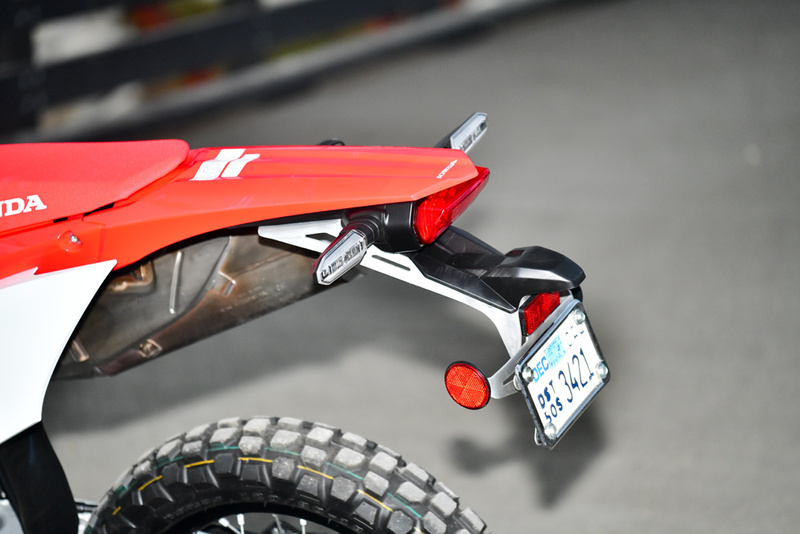 The full-length metal rear subframe extending inside the rear fender provides a stable base for luggage or accessories as well as an ultimately secure place to bolt the license-plate hanger to. Sure, the expanded aluminum plate bracket looks excessive and will certainly be modified by many. But, this is the only one we’ve ridden consistently with that hasn’t disintegrated. Again, the CRF450L has erred on the side of real dual-sport use than “competition” use—real or delusional. The only area we really want to see increased durability so far is with the clutch engagement holding up under moderate abuse. The license-plate holder is a work of art. It’s stout and won’t break off. Weight is a performance factor on all motorcycles regardless of their intended use. It’s an easy comparability tool, although it rarely translates into how a bike feels in normal riding conditions by an owner. After all, how many bike owners jump around on different models for comparisons on every ride? Regardless of ownership bubbles, weight is an accurate indication of what you’re dealing with. And, in the world of dual-sport, it tells you exactly what you’ll need to pick up from time to time. 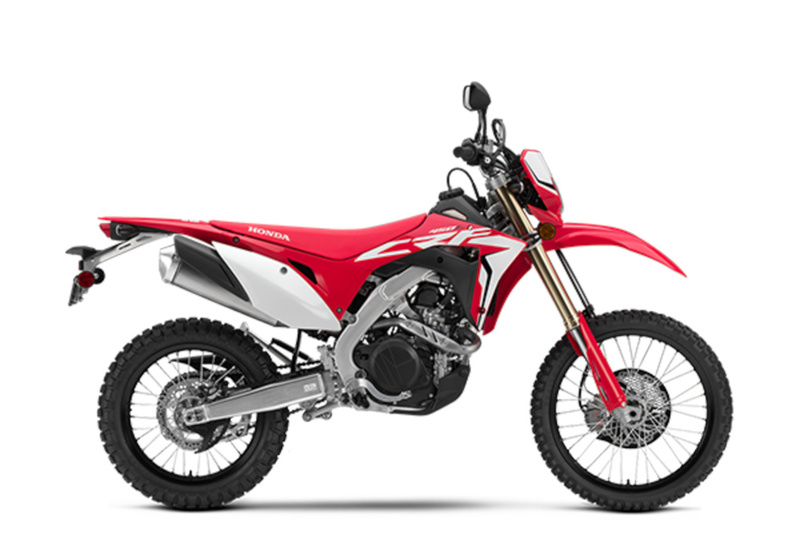 With the Dunlop 606 tires installed with rim locks, the 2019 Honda CRF450L weighs 303 pounds with a full tank of fuel. That tank of fuel is a tick over two gallons. On most levels, the Honda CRF450L does a pretty amazing job at hiding this weight disadvantage (a 40-pound swing versus a fueled-up KTM 500 EXC). Our test riders assumed after hearing the number that the bike would handle like a pile of bricks. They were wrong for the most part and admitted so. While it does feel bigger and heavier, its great suspension performance makes it a non-issue when moving forward or drifting dirt roads. Slowing and turning the bike takes more effort. And the weight rears its ugly head when the bike is trying to move anywhere out of a straight line or trying to loft a wheel. It seems the headlight/computer handlebar area is holding a lot of weight and that makes it harder to ride sand or tight trails than its competition. Still, the trail performance is more than decent. And the weight advantage of stability is usually welcomed on roads and wider trails. In the end, it is hard to ignore 300 pounds. And if you’re looking to add a backpack, some luggage, a bigger fuel tank, handguards and more to the bike, it’s going to be more and more of an issue. We expect weight reduction to be on the top of customers’ modification wish lists. When it comes to fire roads and two-track trails, the Honda really shines. The speedometer/computer on the CRF450L is worthy of praise. It is easy to read, easy to use and provides great information. It doesn’t get fancy with navigation or LCDs, but it does have dual tripmeters with real-time fuel-consumption measurement as well as average-mpg displays. Since the fuel tank is hard to see through (titanium), knowing how much fuel you’ve burned is valuable if you don’t want to walk home. We all really liked the protective engine covers after multiple rides. Even though we know they’re carrying insulation weight, the noise cancellation and rock deflection is more than welcomed. We love six-speeds and thank goodness Honda has one now. It allows us to get creative with gearing for our local riding area and still have legs to stretch on the straights. We have to give props to the suspension again. It’s a home run from the factory. One of the CRF450L’s strongpoints is its suspension, which works fantastic right out of the crate. And it’s fully adjustable. There are a few dual-sport must-dos in my world that just have to happen. And with the CRF450L, these are still true. First, I’d throw the stock mirrors away and buy functional products from Doubletake Mirrors. They have an Enduro Mirror that works great, an Adventure Mirror that is more stable at speed, and we just tested their Trail Mirror and were incredibly happy with the minimalist approach. Just go buy a mirror from them. Next, I’m buying an aftermarket seat. Seat Concepts leads the way in comfort seats in this world and I’ve enjoyed owning one on my personal bike for five years. Even their stock-shaped, competitive seats are more comfortable than any stock seat and last a lot longer. After that, I’m going to finish Honda’s job and put handguards on the bike. An off-road bike without handguards is like an ice cream sundae without a spoon. I’m going to have a really hard time not digging into both with reckless abandon. And I will thoroughly enjoy both. But my hands are going to get messy and I’ll be slightly pissed off the whole time. Not engineering a simple, effective handguard into this bike is a big miss. Finally, I’d search high and low for a new air-filter situation. You have to take four bolts, with two different-sized tools, out of the bike to get to the air filter. And then you squeeze your hand into a narrow airbox and unscrew another winged bolt. Quick-access to air filters is the industry standard and this is far from that. This could be a deal breaker for those who often ride in dry, dusty climates where frequent air filter changes are a must. 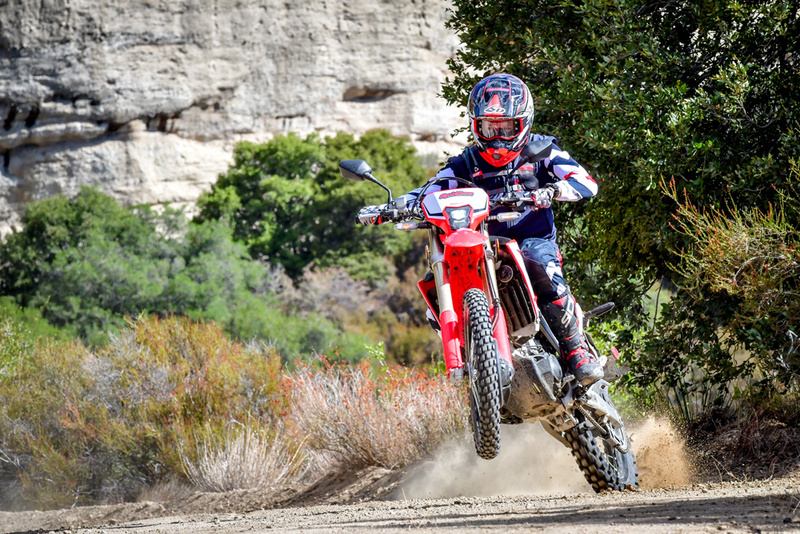 The CRF450L gives us another great option to get out and enjoy days on the dirt like these. Who is the CRF450L for? If you’re looking for a street bike-focused dual-sport with street-bike service intervals, this isn’t for you. It’s for the person who wants the freedom of a plate to take them to trails and roads they really want to ride a dirt bike on. Also, if you’re looking for a replacement, one-bike-does-it-all version of your current recreational/race bike, the CRF450L probably isn’t it. 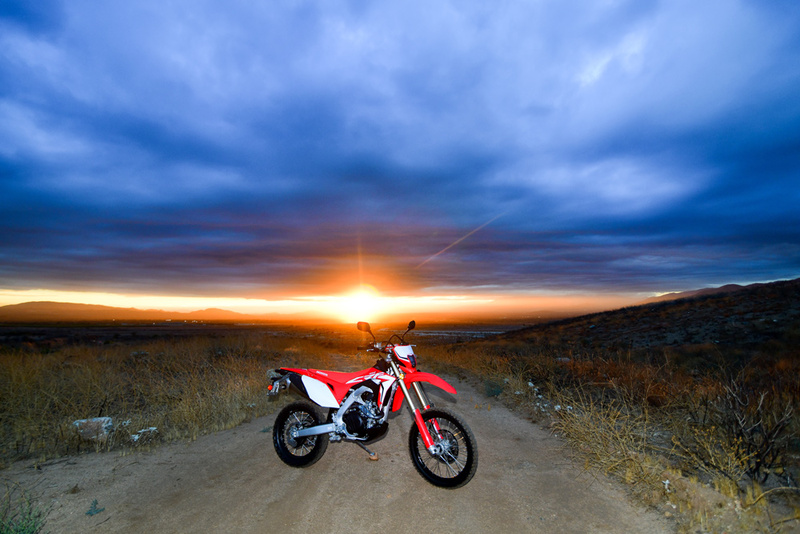 The Honda CRF450L is perfect for the rider looking to ride easier trails, amazing two-track and epic dirt roads. It is more comfortable sitting down than other bikes, and, in our testing, it will give you a 75-80 miles of range at a conservative pace. 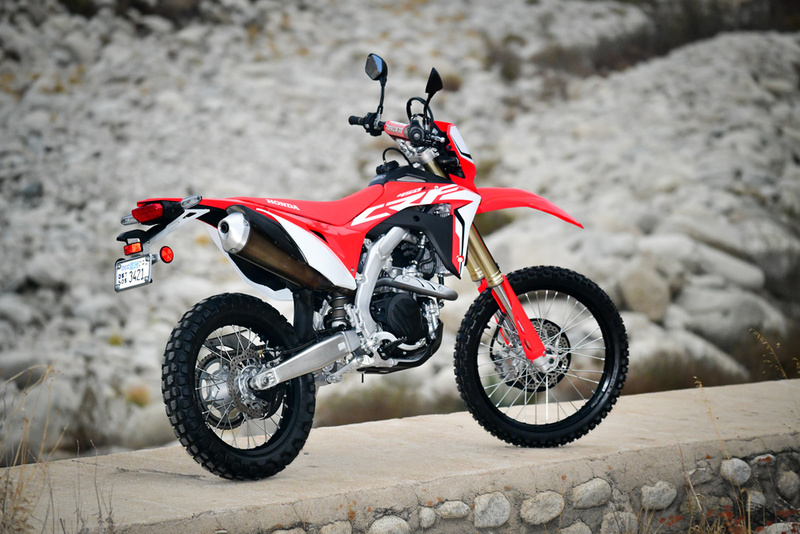 *[Note 11/23/2018: In the light of transparency and providing the most complete information possible, we’d like to remind readers the published weight of the 2019 Honda CRF450L is with Dunlop 606 Tires and both rim locks installed as mentioned. Stock, the bike does not have rim locks in the wheels and the stock IRC tires are considerably lighter than more aggressive tires like the 606. In fact, the Dunlop 606 is one of the heavier tires in the segment. Also, Honda press fleet confirmed out bike was fitted with heavier duty tubes than standard for the intro, as well. This bike was taken straight from that intro. So, there are additional weight considerations on this test bike than a true stock machine, but most people will be swapping tires and installing rim locks. Click here for the latest Cycle News Dual Sport motorcycle reviews and news.